You are at:Home»News»The Match: Tiger Vs Phil, Success or Blunder? The Match: Tiger Vs Phil, Success or Blunder? When news that Tiger Woods and Phil Mickelson were in talks for a high stakes, winner take all match, the golfing world was on fire. The rivalry that has held our attention for two decades finally comes to a head, the Big Cat vs. Lefty, one-on-one for $9,000,000. The course they played was Shadow Creek Golf Club in Las Vegas, Nevada. The setting was fitting, the mecca for gambling would host two golfing legends for the ultimate round of match play with the potential for millions more bet during the round. Surprisingly, this is the first time in their careers that they have faced off head-to-head in match play. This was also the first Pay Per View golf event in history. The Match forged into a new and controversial territory for the sport of golf. Unfortunately, timing, corporate sponsorships and decision making, as well as faulty technical issues and overall uninspired play inhibited this event from being what it truly could have been. The first issue revolves around the stakes. By not allowing the players to put $4.5 million dollars of their own money on the line, the event instantly removed any fire or ammunition from the players. It stings a whole lot less for Tiger or Phil to not win a corporately-sponsored purse than to lose $4.5 million dollars of their own money. Players could make a select number of challenges throughout the round, and those were their own money. However, neither player could pocket that money themselves, it would be donated to the charity of their choice. I’m not saying that is a bad thing, but it wasn’t what the tenor of this event originally was billed as. As we are learning more and more about the behind the scenes from the event, it became apparent that too many entities, from TV Network executives and agents to PGA Tour executives, were involved in the planning and structuring of the event (including how many side bets could be offered by each player and the maximum total amount the challenges could equal). Their involvement took a no-holds barred bout and watered it down to an incredibly tame version of itself. This event was supposed to be all about the money. An opulent display of two mega-millionaires risking a small fortune to beat their longtime rival out of their small fortune. By sponsoring the purse, limiting the number of challenges and making those challenge windfalls charitable donations altered the entire premise of the event. An event like that is a good idea, but it wasn’t the original concept for The Match. It changed what was supposed to be a gambling-fueled, contest of bravado into an exhibition of legends, playing for good causes and one very large appearance fee. The second issue with the event was the over-abundance of TV personalities and announcers. The players were both mic’d up, but throughout the entire event the over-eagerness of the announcers to interject the ambient atmosphere cheapened the aura and enjoyability of the event. With that said, I wanted more of Pat Perez. His insights into the game as well as his quips and barbs to Charles Barkley offered a much-needed respite from the otherwise stiff and almost PGA Tour event-like feel the broadcast pushed. Tiger is known for having a bit of a foul mouth and Phil is known for his verbal jousting. Throughout the entirety of The Match we got neither. Players were on their P’s and Q’s and it made for dry, unappealing banter. This is Pay Per View, let them be unleashed, brash, even obscene and offensive. This felt like a Disney version of what should have been an R-rated show. One great aspect of the players wearing a mic was their interactions with their caddies. It was fascinating to listen to them dissect shots and work through formulating a plan for each shot. The amount of information they gather in preparation is astounding. The third issue stems from the availability of the event. Turner was forced to offer The Match for free when many users were unable to purchase or log on to the event. This is nothing new for Pay Per View events. People pay anywhere from the $20 this event cost to over $100 for some title fights. The expectation is that networks provide the same consistency to their specialty events as standard live TV. Any interruption or inability to view the event casts a dark cloud over its success. Lastly, the issues of timing. Much like the Pacquiao fight against Mayweather, this event is a decade too late. Neither Phil or Tiger are near the peak of their game anymore and the product on the course showed it. Also, both men have matured and evolved. Their priorities have shifted, winning at golf is no longer the most important thing in their lives. The fire and venom of Tiger and Phil’s rivalry has dissipated into a jovial friendship. Sure, they want to beat each other, but at the peak of their careers, these two could hardly muster the ability to look at one another. They had laser-like focus and one objective, obliterate the other. Do I Really Want to be Here? It can be argued the reason for the uninspired play is intertwined and linked to all the above issues. The course set up for a lot of halved holes, but neither player made any shot of significance through much of the match. I was confounded to see greens that had obvious tine marks from being punched. A match like this requires immaculate and consistent greens. This factor played into the match, both players left putt after putt short. 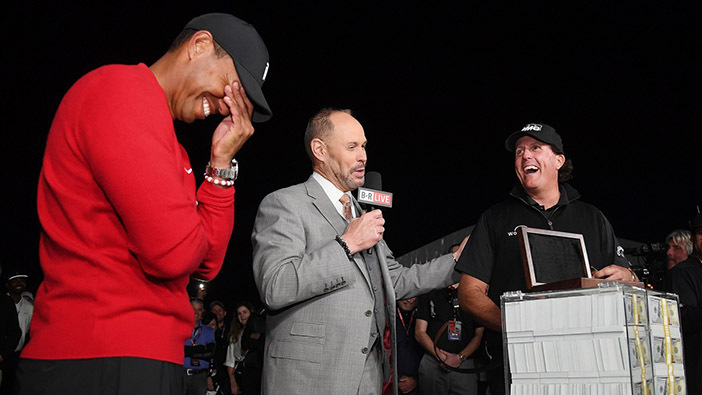 On the 22nd hole, Phil Mickelson may have won The Match, $9 million and a belt that doesn’t fit, but what he said to Tiger on the 21st hole seemed apropos for the entire event. As flood lights illuminated the 18th green, Tiger lined up a 5-footer to halve the hole with par. Phil gave a long look and finally conceded Tiger’s putt saying, “I don’t want to win this way”. This was supposed to be anti-conservative golf. This was supposed to show a behind the scenes look at players when the cameras are not around. There were supposed to be bets made constantly. This wasn’t supposed to be played like a sanctioned event. The Match fell short of so many expectations, but down the stretch on the back 9 it did get a lot quieter between the players and the action became much more intense. The most dramatic moment of the match came on the 17th hole with Tiger 1 down and facing a downhill chip with Phil looking at a potential match-ending putt. In vintage Tiger fashion he stalked the line up and down, and knowing he needed a miracle, he reached back into the time machine and holed out the shot. Both players exclaimed, “Just like old times!”, and for a moment, it was. The concept is there, it just needs some better oversight. Maybe this should be managed and run by a casino in Las Vegas. They are corporations equipped to handle the logistics putting on a high-stakes match and wouldn’t be constrained the traditional sensibilities of the PGA Tour and media outlets. Currently, there are many players in the world ranked higher than either of these men on the Official World Golf ranking who are all thinking to themselves, ‘why wasn’t I selected for this event? If corporate dollars are going to supply the purse, I’m a much better player at this point than either of these guys and I can give fans a much more exciting match…’. In my opinion, one thing is for sure, players need to put up their own money for this event to be successful. We want to see them put up their own buy-ins and have the pressure of winning and losing a small fortune from their own pocket. We want to see them be allowed to gamble and put pressure on their opponent the whole round, not just an allotted amount of times and amounts. I was issued a refund for this Chicken S broadcast. It was an absolute debacle trying to watch it on Pay Per view and I will never buy anything thru B/R Live again.